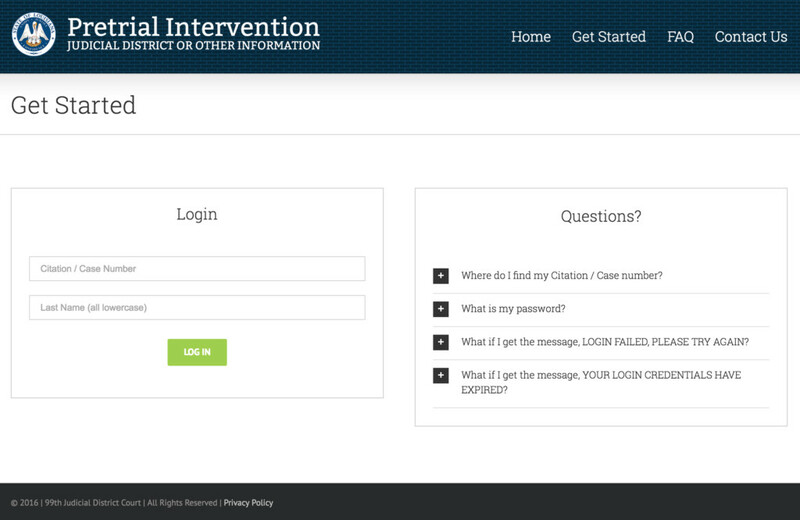 How do I participate in the Pretrial Intervention Program? In order to participate in the program, you must have been referred to the courses by the court, district attorney or another prosecuting agency. If you are unsure if you can participate in the program, please contact the agency where you received your violation. What if I am having trouble using the site? If you are having trouble navigating the site or completing the program, please visit our Video Tutorials section, which will guide you through the process. If you are still having trouble, please send us a support ticket or call us at 866-225-6184. I completed the course, but I did not receive my certificate. What do I do? Certificates are emailed to the email address you entered in the billing details. There several reasons why you may not have received your certificate. You entered a invalid email address in the billing section during checkout. Your billing email address is used for receipts and certificates. If you incorrectly entered your email address, you will not receive your certificate. If this is the case, you can log in to your Student Dashboard and download the certificate directly from that page. Your email address is valid, but it has automatically filtered the email into your spam or junk mail folder. This is especially true for Gmail accounts. Please check your spam and junk mail folders. Otherwise, you can log in to your Student Dashboard and download the certificate directly from that page. Your payment was declined or did not fully process. Your course is not complete until you have submitted payment. Once your payment is submitted, the system will email you a receipt and certificate. If you need to submit a payment for a completed course, please log in to your Student Dashboard. I think my credit card was charged twice. What does this mean? When you submit an online payment, your credit card is not actually charged at that time. The processor checks with your credit card provider (or bank) to make sure you have enough available credit to complete the transaction. They also check to make sure the billing address you entered matches the billing information on your credit or debit card account. At that time, the card issuer or bank places a hold (or a pending charge) on those funds. The credit card issuer or bank does not finalize the transaction until early evening when the card processor sends the final transaction confirmation. This means that any declined transactions will show on your account as pending charges until the credit card issuer or bank removes them. The time involved varies with each credit card issuer or bank but can take anywhere from 2-5 days. This is a not unique to our website, but it is how virtually all online transactions are handled. If you have any questions, please contact your bank or credit card provider. What happens if I do not want to participate in the program or if I miss the time frame for participating? The 1st Judicial District Attorney’s Office Drivers Diversion Program is an optional program and you are not required to participate. If you do not wish to participate, or if you do not complete the course within the time period granted, your citation will be processed and you will be required to comply with the decision of the court. 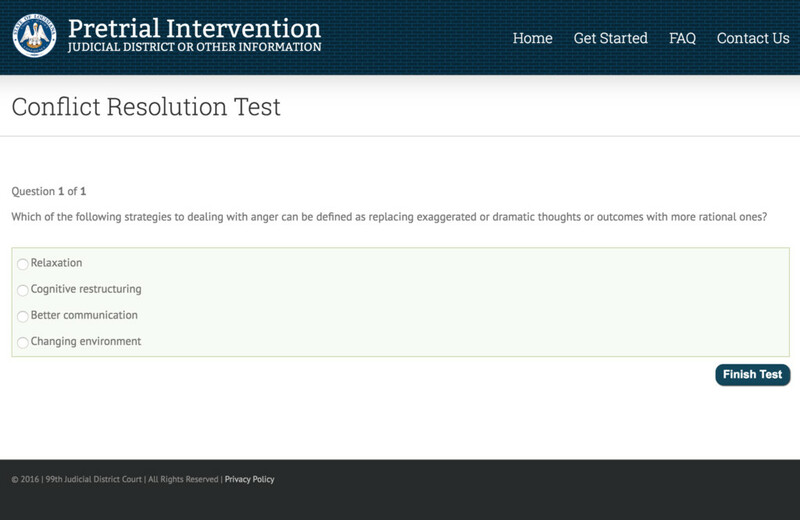 Why should I participate in the Pretrial Intervention Program? The Pretrial Intervention Program is an opportunity afforded to select offenders for the purpose of education and rehabilitation. While participation in the program is optional, offenders who are offered the program and do not complete the course within the time period set out, the case will be remanded back to court for prosecution. How do I know what will be on the test? 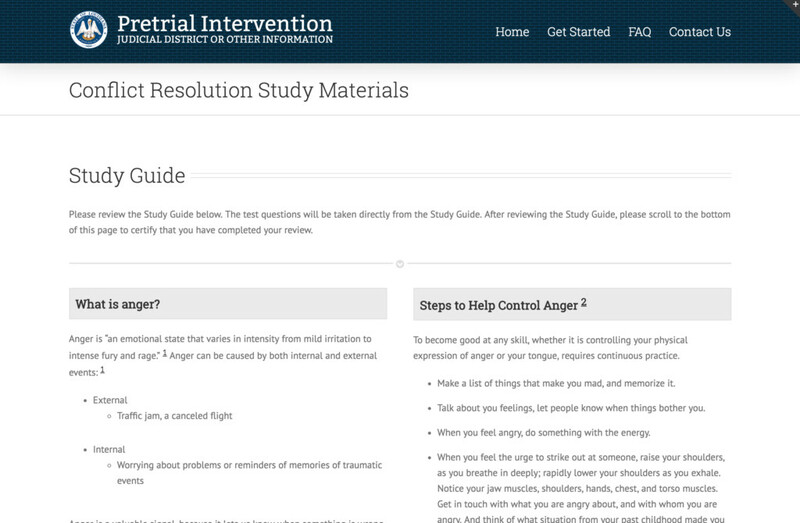 Test questions are developed using the study guides and materials found on the respective entry pages for each program. How many questions do I need to answer correctly in order to pass the test and complete the program? Each program has its own requirements for passing the test. Please see the respective entry page for your program for more information. If you do not pass the test, you will be directed back to the entry page for your program where you can review the study guides and materials. You will then be allowed to take the test again. You can take the test as many times as needed in order to pass. However, you must complete the test in one session. If you do not complete the test in a single session, you will be required to take the test again. What happens when I pass the test? After you pass the test, you will receive a completion certificate via email. Your course fee is non-refundable.